How do we make sure that happens? For us, it means that we follow the law. In 1972, Congress enacted the first comprehensive national clean water legislation in response to growing public concern for serious and widespread water pollution. The Clean Water Act is the primary federal law that protects our nation’s waters, including lakes, rivers, and coastal areas. Very simply, that means we cannot allow anything to go into a storm drain that is not storm water or rainwater runoff. So what is a pollutant? According to the EPA and other regulatory bodies, this includes not just soaps, acids and other cleaners, but leaves, debris, and plain ol’ dirt. To the right is a photo I took at an area restaurant showing a restaurant employee in clear violation of the Clean Water Act. EPA may issue an order to any person or company who violates the Clean Water Act. The order may impose a civil penalty plus recovery of any economic benefit of noncompliance and may also require correction of the violation. Who must comply with the Clean Water Act? Any ‘person’ discharging a pollutant into the waters of the U.S.
A ‘person’ is defined as an individual, corporation, partnership, association, state, municipality, commission, or political subdivision of a state, or any interstate body. Under Section 309 of the CWA, penalties for violating the permit or not having a permit to discharge into the waters of the U.S. may be up to $27,500 per violation per day. Under Section 311, a Class I penalty may be assessed in an amount of up to $10,000 per violation, not to exceed $25,000; a Class II penalty may be assessed in an amount of up to $10,000 per day per violation, but not to exceed $125,000. protects valuable wetlands and other aquatic habitats through a permitting process that ensures development and other activities are conducted in an environmentally sound manner. What to do then? 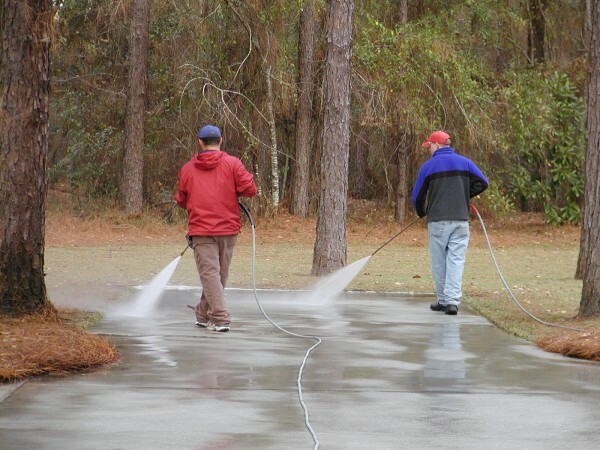 We have several different methods available to us to deal with wash water, which is why we follow the recommendations of the Power Washers of North America (PWNA) and issue a Pollution Prevention Voucher to our clients. Upon completion of the work, this documents the safe and proper disposal of any wash water left onsite. Be careful choosing a contractor who claims he doesn’t “know about it,” “it’s not a big deal,” “it’s EPA approved,” or “I use biodegradables.” The EPA and complementary regulatory agencies takes a dim view of any of the above excuses, they don’t “approve” anything, and it won’t diminish your liability as the property owner. 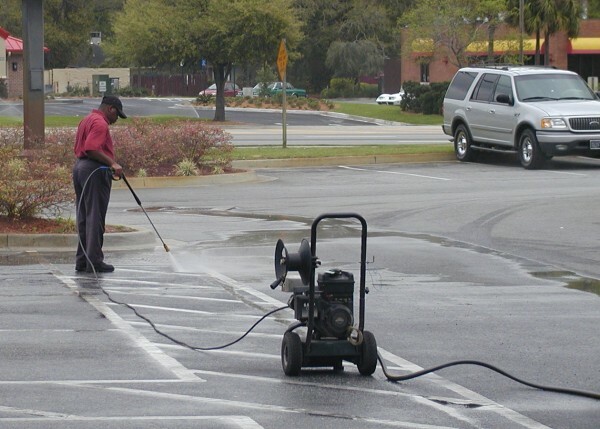 In short, if your contractor can’t explain why the below photo depicts a legal and environmentally safe action and the young man cleaning the restaurant parking lot above is not, you may want to think twice about risking your property in his hands. More information on the Clean Water Act is available at the Environmental Protection Agency website, and another excellent resource at Delco Cleaning Systems website.